Anxiety and stress are primal factors that stand in the way of substance addiction recovery. Sound therapy uses resonance, rhythm, and vibration to create positive changes at a cellular level and relieves stress. What Is the History of Sound Therapy? Even though people from different cultures have been using vibrations for effective healing practice for centuries, only recently scientists have begun studying the impact music and sound have on human emotions. It was only in the 1950’s that a distinct research team ventured into the realm of sound therapy and its benefits. Since then, a growing body of evidence points to the effectiveness of sound therapy and the positive emotional results it has in people undergoing drug rehabilitation. In the 70s, for example, biophysicist Gerald Oster found that binaural beats can sync to the brain hemispheres and enable a process known today as “brainwave entrainment.” This type of treatment can help create a more positive existential frame for the recovering addict. Just as with any alternative approach, sound therapy has its skeptics. However, when more than 20 clinical studies prove its efficiency in addressing cognitive functioning deficits and relieving stress, more and more rehab centers are introducing sound therapy as part of their holistic plan. Evidence shows that the outcomes of sound therapy are positive and beneficial to patients’ behavior, especially when doctors pair them with other scientific methods, such as individual therapy, behavioral therapy, and so on. 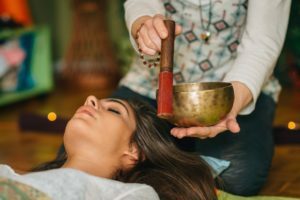 What Other Therapies Are Often Used in Conjunction with Sound Therapy? Using sound, rhythm, and vibration in conjunction with other conventional or alternative therapies, such as individual or group sessions, yoga, brain mapping, exercising or acupuncture enables patients to tackle not only the physical effects of the addiction but the emotional and mental ones too. More often than not, addiction also leads to the development of a co-occurring condition (or vice versa) and cleansing the body of the substance isn’t enough for a complete and lasting recovery, patients must also address the physiological and emotional issues that may have led to the destructive behavior in the first place. Sound therapy allows professionals to tackle addiction at brainwave level, thus making easier for patients to achieve a meditative state and come to terms with their problems. Windward Way is dedicated to a holistic approach to substance abuse treatment. It makes us what we are and everyone working here knows how important it is. Our definite goal is to craft our drug rehab and alcohol treatment program to use many different modalities for treatment like sound therapy. Sound therapy can help men in recovery discover an alternative to using alcohol or drugs to unwind after a stressful day at class, in the office, or at home. Since our rehab center draws on not just the traditional addiction treatment strategies, but also newer, more innovative methods like sound therapy, our addiction treatment program can address your substance use from many fronts, with a whole multitude of new and novel approaches. Many of these have stuck for the graduates of our program as healthy practices they do from day to day to help them maintain a healthy, long-term recovery. In addition, sound therapy can offer men a path to rediscover their emotional core using music or sound to get deeper issues that might be at play. Sound therapy may also alleviate boredom and loneliness—two intense relapse triggers for most men fighting addiction. Offered in tandem with other modalities for treatment like meditation, music and meditation tracks can become a powerful ally to help young men discover the purpose and meaning of their lives. We can answer any inquiries that you may have about sound therapy or for the other therapies we employ to effect a real transformation for men. Let’s build a program, made just for you. You deserve another chance with Windward Way’s help to guide you: 855-491-7694.